Good Monday Morning! I guess it's technically now Monday afternoon, but it was a.m. when I started this post. Monday mornings quite often get away from me somehow. I'm regrouping here after a fun weekend on the lake with nine of my college sorority sisters. In spite of the less than stellar weather we had a fabulous time catching up with one another in person. One friend was there who most of us hadn't seen in 36 years so that was really special. 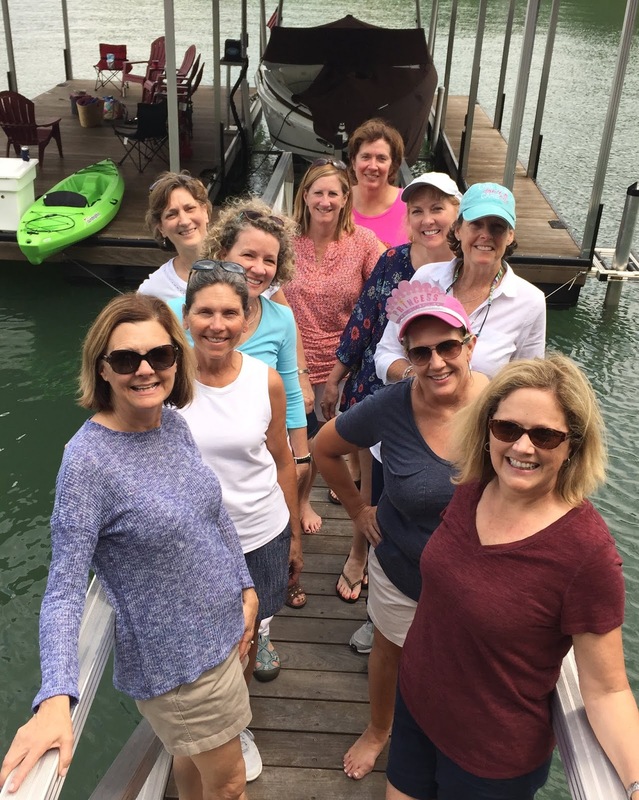 There were ten of us all together and two of us have houses on the same lake so we spent Friday at her house and Saturday at mine. Half the group slept there, and the other half here, everyone brought food and drink, and it was all so easy peasy. We talked and we laughed and we told stories and put our collective brains together to remember things we'd forgotten. So much fun! It was mostly cloudy all weekend, but we still spent a lot of time outdoors, sitting on porches and patios and docks. The sun popped out long enough for a boat ride Saturday evening which was nice. Hubs acted as Cabana Boy and waited on us hand and foot and took pics so yay hubs! He knows all the girls and I think enjoys catching up with them as much as I do. Hey, did you hear there was a wedding this weekend? Ha! The hype leading up to the day was a little over the top, but we loved watching it together. I thought she looked lovely and let her natural beauty shine. People are sometimes just plain awful aren't they? So many mean spirited comments in the world of social media. What is it about weddings that brings out the inner critic in everyone? She might be marrying into the royal family, but I thought the ceremony felt like it belonged to the bride. I have to say I felt for the mother-of-the-bride. How hard to be on your own in that particular setting, but she seemed to handle it with grace and I admire that so much. Also, Windsor. Sniff. How I miss you. I loved seeing the town almost more than I enjoyed watching the wedding. 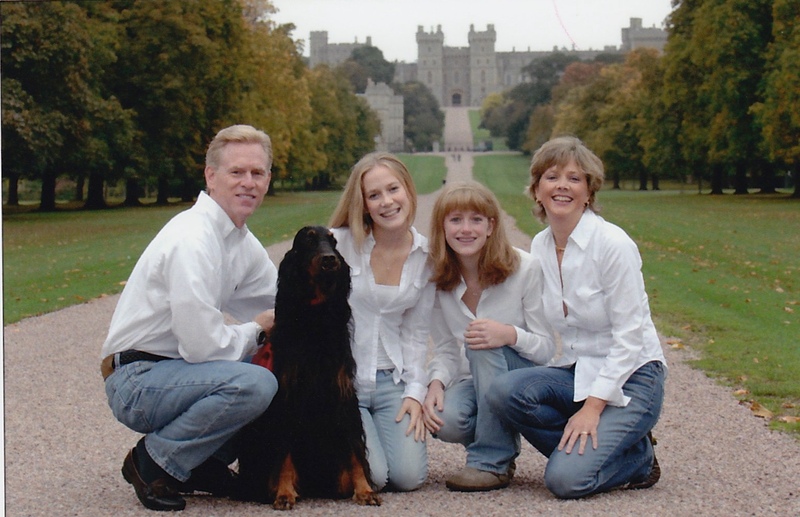 We spent a lot of time in Windsor back in the day and have our own favorite photo taken on the long walk. And now it's Monday and we're back to a quiet house. Hubs has already repaired a broken door lock and is power washing the dock because he always needs to be doing something. I'm tackling the laundry mountain, straightening the house, putting away stray dishes-table leaves-and the like, catching up on my blog, and drinking gallons of coffee. There was a whole lotta fun packed into these past three days, but not a whole lotta sleep. So did you watch the wedding? What did you think? Happy Monday all! I was up early watching the wedding and shed a few romantic tears for the couple. They seem very much in love, the way they look at each other, and I hope their lives will be filled with joy. I recorded it to watch so I could fast forward. Their smiles were beautiful. It was fun watching the reactions and expressions of the guests ... seeing everyone's outfits ... those adorable kids. The mean comments are tiresome and I just saw a news story that said her half sister had a film crew at her home as she watched the wedding. I wonder if that's true. She doesn't seem to give up trying for attention. So sad. And yes, Meghan's mother showed great grace. I missed the first 10-15 minutes but came in when Curry was preaching. Loved the choir with the soloist the most of all. But I thought overall it was a very nice wedding and I loved her dress. I taped the wedding and watched the five hours in about 90 minutes. I paid attention to the important parts and zoomed past the chatter. She looked stunning, the music was AMAZING and the preacher preached a good sermon that had me giggling at the faces in the 'audience' reacting to his style. 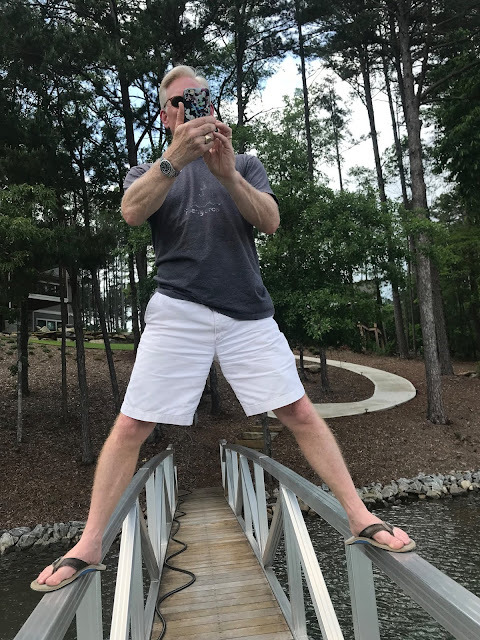 Looks like y'all had a great time reconnecting!! So fun! I was up early to watch the wedding . My cousin called and she sat at her house while I sat at ours watching the wedding and commenting on it all. I was grounded and couldn’t leave the house and couldn’t have any one over. It was the next best thing. It was beautiful! I loved it all! The wedding was perfect. Meghan was stunning and I agree with what you said, it was her wedding. So glad you had a wonderful weekend with your friends. Being Canadian, I’ve done my share of getting up early to watch royal weddings so I left this one to watch in the reruns. Meghan (excuse me, Her Royal Highness the Duchess of Sussex) looked radiant! Her dress was incredibly elegant, as were her flowers - and that tiara! Perfect in their simplicity, all. I love that they’re so much in love. I hope she can stand up to the life-long scrutiny now. When you’re a royal, your life is really never your own again. I was in NYC with 5 of my girlfriends and we got up early on Sat. morning and watched it and loved every minute of it. I'll say it again, you are so the "hostess with the mostess" and I know your guests always feel so very special.What a memorable time for all of you. I just loved the wedding and seeing the town of Windsor in the spotlight. So many great memories there!